Through the Tack Faculty Lecture Series, a William & Mary professor will address the community at least once a semester. 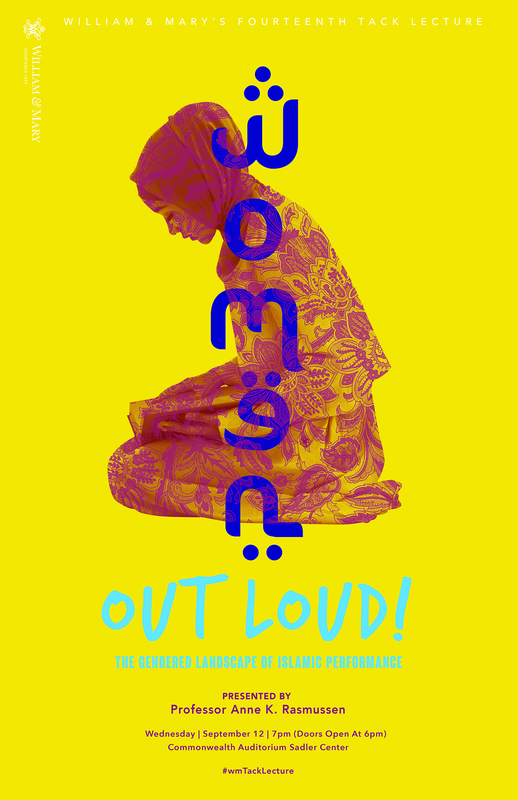 Anne Rasmussen, professor of music and ethnomusicology presented “Women Out-Loud! The Gendered Landscape of Islamic Performance” as the fall installment of the Tack Faculty Lecture Series. Welcome to the vibrant and creative performance of religion in Indonesia, the country with the world’s largest Muslim population. Informed by the circulation of language, song, goods and ideas around the Indian Ocean and from the Arab world over the last half millennium, the expression of religion as popular culture is essential to the Islamization of this vast archipelago. From Quranic recitation to collective devotional singing to Islamic Pop, the musical expression of religion is ubiquitous. Another salient feature of this religious civil society is the public participation of women, whether precocious school girls or powerful matriarchs. In her Tack Faculty Lecture, Anne Rasmussen, professor of music and ethnomusicology, described the historically-prominent female “ritual specialist” as a precedent for the prominence of women in public performance. This apparently egalitarian public realm, however, remains under the control of entrenched patriarchal nationalism, a force, she argues, that keeps such Women Out Loud in check. Proactive advocacy for women’s access within and beyond their role “in the business of religion” is absolutely critical today, when both ethno-nationalist populism and Islamic extremism, born globally but nurtured locally, threaten to smother Indonesian religious practice, and to silence women. Based on ethnographic fieldwork over the past twenty years, Dr. Rasmussen introduced the audience to the kaleidoscopic soundscape of women's religious performance in Muslim Indonesia. Anne Rasmussen, professor of music and ethnomusicology, introduced the kaleidoscopic soundscape of women's religious performance in Muslim Indonesia during her Tack Faculty Lecture on October 9, 2018.